FORT GEORGE G. MEADE, Md. 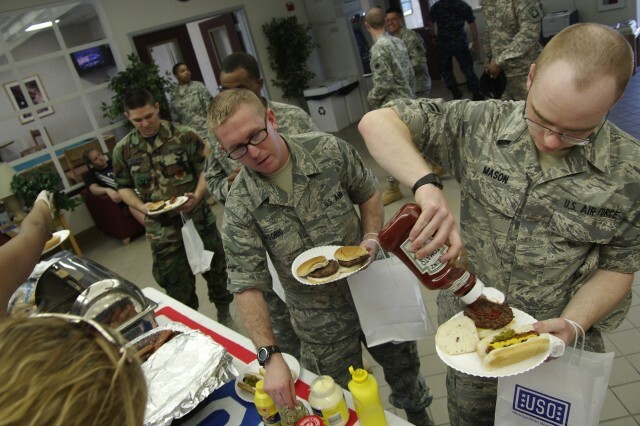 (June 2, 2011) -- For the second consecutive year, Fort Meade's service members were honored at the USO's Service Member Appreciation Barbecue. 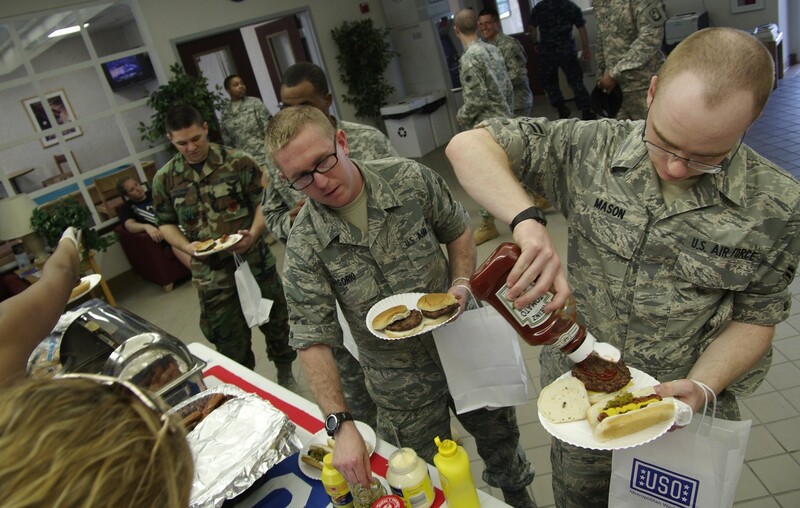 About 320 service members were treated to grilled hamburgers, hot dogs, chips and drinks at no charge on May 26 at the Freedom Center barracks. "We do this for you," said Queen Waddell, Fort Meade's USO coordinator, at the two-hour event. "You sacrifice a lot for us. This is our small way to say thank you." Pvt. Brian Serna of the U.S. Army Signal School Detachment at the Defense Information School was happy to be recognized. "I love it," he said. "I'm really grateful to them for showing appreciation. It's like a good old-fashioned, down-home barbecue." Waddell said the event is held "as a small token of our appreciation for all the sacrifices service members make on a daily basis, both here and abroad." The Fort Meade USO, located at 7007 A Baker St., serves active-duty service members and their families on post. At Fort Meade, the volunteer-run organization provides a fully stocked food pantry, emergency food and housing assistance and several special-interest activities, such as a knitting club, writing club and scrapbooking. Spc. Eric-James Estrada, also from the Signal School Detachment, said the barbecue is a great way to lift a Soldier's spirits. "It really helps with morale," he said, noting that the Soldiers in his unit are always busy with classwork and military training exercises. Staff Sgt. Ross Richard, of the Warrior Transition Unit at Kimbrough Ambulatory Care Center, said he is grateful for the work of organizations such as the USO and the WTU medical staff who help service members. "I feel real good," Ross said about the event. "It's really nice." Before the barbecue ended, Waddell distributed free T-shirts, gift cards to local restaurants, DVDs and four tickets and parking passes to a concert featuring country music singer Kenny Chesney. Three video game consoles and four popular video games were presented as prizes for a USO trivia game. "I think it's wonderful; the USO has always supported the Soldier," said Sgt. 1st Class Scott Maynard of the WTU, who received an Xbox 360. "I appreciate everything they do for our community here." Sgt. 1st Class Elston Gentle, a platoon sergeant at the WTU, said he, too, was happy to attend the event. "I love it, just to be around Soldiers before a four-day weekend," he said.